Complementary and alternative medicines are used by 1 in 2 patients before and during cancer treatments, however they are frequently associated with drug-drug interactions, a estudy at ESMO 2018 report. European Society for Medical Oncology (ESMO), Munich, Germany – By administering a structured survey over a 4-month period (1 January – 30 April 2018), a team from the University Hospital Mannheim, Germany, investigated types and modes of use of non-conventional therapies among 152 outpatients with sarcoma, gastrointestinal stromal tumour (GIST) and desmoid tumours receiving care at a sarcoma centre. Researchers considered complementary alternative medicines (CAMs) as a broad range of practices including supplementation of vitamins or minerals, Chinese or healing herbs, homeopathy, acupuncture, meditation, yoga, Tai Chi or changes in dietary habits, like switching to a ketogenic or vegan diet. The main results of this study to be presented at ESMO 2018, showed that 51% of participants had used alternative methods in their lifetime, and 15% of them only during the disease, in parallel with cancer treatments. 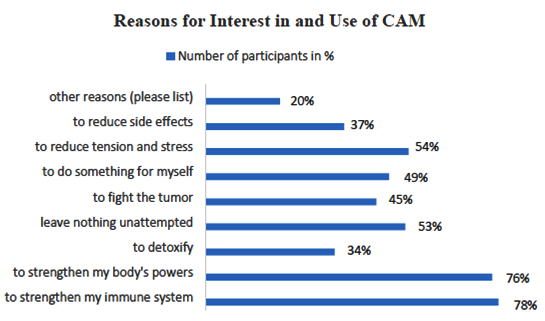 Also, cancer diagnosis showed to have sparked patients’ interest in CAMs in 44% of participants. Patients were shown to be selective in their choices, as study supervisor Prof Peter Hohenberger said: “What we found is that vitamins and minerals are very popular but patients take them specifically rather than using multivitamin supplements. Vitamin D is in the leading position, followed by selenium plus zinc, vitamin C, and interest in vitamin B17 is emerging”, he highlighted. Commenting on these results for ESMO, Dr. Markus Joerger of Cantonal Hospital in St. Gallen, Switzerland, said that the low risk perception associated with CAMs among patients is a big issue. “Patients tend to believe that supplements or herbs are generally safe, but they are not without risk. In daily practice, if you don’t know what your patient is taking as alternative medicine, the risk of drug-drug interactions can significantly increase and have an impact on clinical outcomes.” He also added that oncologists should try to preserve their role as primary source of information for cancer patients: “Although we must not demonise the Internet or other sources of information, getting information outside the clinical setting can often be misleading. Patients have to realise that they can discuss any health-related choices with their oncologist and be advised on different options when they wish to reduce stress related to cancer treatment, or more in general to feel better”, he said. Lead author Dr. Audrey Bellesoeur of University Paris Descartes, France, said: “We know from previous research that one in three ambulatory cancer patients are susceptible to potential drug-drug interactions (DDI). A better understanding of these mechanisms is necessary today for a real personalised medicine.” In the study, DDI were more frequently observed with tyrosine kinase inhibitors while gemcitabine was associated with a significantly lower risk. “However, cancer centres must also invest in integrative medicine that combines medical anti-cancer treatments with non-conventional therapies. The average oncologist has poor knowledge of these alternative methods; this is mostly due to a lack of studies and databases in the field. More efforts are needed to understand how to deliver mixed treatments safely and to build up experience to better advise our patients”, he concluded. Based on evidence collected so far in the breast cancer setting, ESMO has recognised the benefits of physical exercise, mindfulness-based stress reduction (MBSR) programmes, hypnosis, yoga and acupuncture in supportive care while the use of antioxidants supplements, herbs, minerals, oxygen and ozone therapy, proteolytic enzymes, phytoestrogens, high-dose vitamins is not recommended as it has been associated to no beneficial effects or negative outcomes.